There are not many mobile slots out there that can help to define the reputation of a developer. However, Book of Ra Deluxe is one of those mobile slots and fans of the series will be delighted that it has been released on the mobile platform. Book of Ra Deluxe is a 5 reel, 10 payline mobile slot from European slots developer Novomatic that has an Egyptian theme. 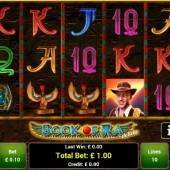 Players can find a range of symbols on the reels that hold a resemblance to icons you might associate with Indiana Jones but we can assure that no copyright terms have been infringed during the making of this slot. Symbols on the reels include the treasure hunter aka the Indiana Jones lookalike, a Pharaoh statue, an Egyptian winged Goddess statue, and a Scarab, plus the regular 10-through-to-Ace symbols that you would expect to see. The eponymous Book of Ra acts as the Wild on this slot and will substitute for all other symbols to help complete any winning combinations that might come up on the reels on a spin. Interestingly, the Book of Ra also acts as the Scatter on this slot and is the key to triggering the free spins bonus round. You will need to hit three or more of the Book of Ra symbols across the reels to trigger the free spins bonus round. You will receive 10 free spins once triggered with a 2x multiplier added to any wins you hit during the free spins. Fancy a Special Expanding Symbol Too? This is no ordinary free spins bonus round though. There is a Special Expanding symbol that will appear on the reels. This symbol will cover all three positions on a reel and will only appear if there are enough symbols on the reels to complete a winning combination. In fact, if the Special Expanding symbol appears 2, 3, 4, or 5 times during the free spins then its value will be multiplied by the number of paylines being played. 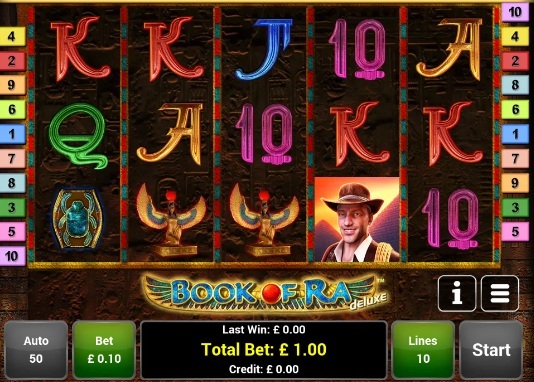 Book of Ra Deluxe has long been considered one of the most iconic slots around so I am thrilled that it has been launched on the mobile platform. It has far more appeal than a couple of other Novomatic mobile slots such as the bland Plenty on Twenty and the mediocre Sizzling Hot Deluxe and will continue to be a hit with slots players for its simplicity and potentially large pay outs.